There are many lesson we learn as we experience our lives. 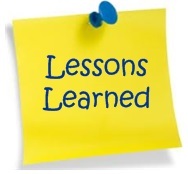 Below is a list of insightful lessons learned by someone. I’ve learned that you shouldn’t compare yourself to the best others can do but to the best you can do. I’ve learned that no matter the consequences, those who are honest with themselves get farther in life. I’ve learned that no matter how many friends you have, if you are their pillar you will feel lonely and lost at the times you need them most.